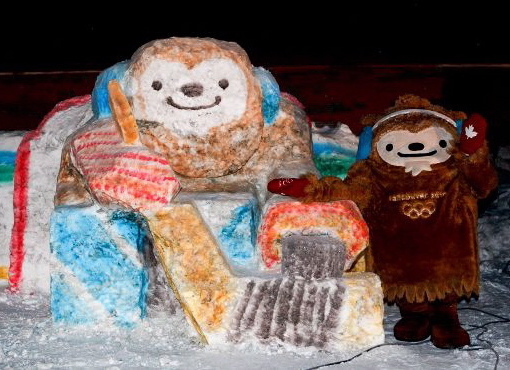 Quatchi Rendered in Snow, Wood! In October, Quatchi was way up in Alert, Nunavut, the northernmost permanently inhabited spot on earth, while following the Olympic torch on its relay route. There he was greeted by this giant frozen likeness of himself tending goal. I can’t seem to track down where I got this particular image, but here’s another look on this French-language blog. 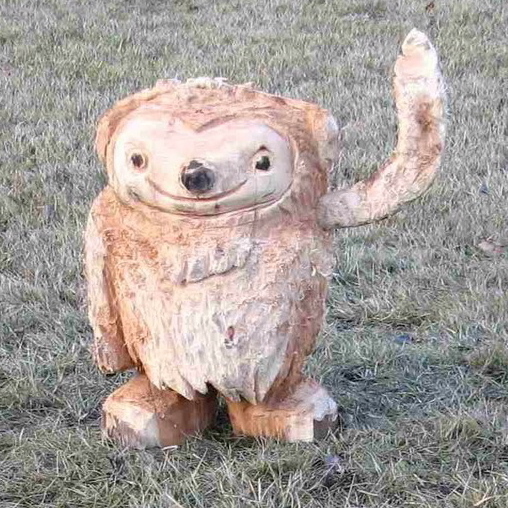 Then last month, a Quatchi carved in wood (possibly by chainsaw? ), was spotted in Sorrento, British Columbia by Fida Wild. This entry was posted in Uncategorized and tagged art, crafts, Quatchi. Bookmark the permalink. Cute, eh? His arm even looks like a hockey stick. I wonder if he had something to do with ‘our’ Olympic gold medal?